With 4,655 miles of coastline, Brazil boasts scores of lovely beach towns. One of my favorites is the small city of Cabo Frio (pop. 200,000), which lies in the Região dos Lagos (Lakes Region) northeast of Rio de Janeiro. Cabo is a popular getaway for residents of Rio, which is quite a recommendation. Cabo is located two hours by good roads from Rio and Galeão International Airport. Sandwiched between the South Atlantic and Araruama Lagoon, Cabo offers a range of water activities, from laid-back to exhilarating. 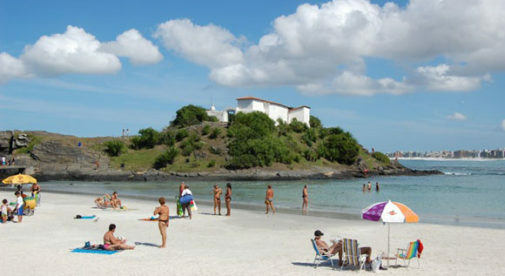 The principle beach is Praia do Forte, or Fort Beach, named for Fort São Mateus at its extreme eastern end, built between 1616 and 1620 to safeguard these waters from the French and other interlopers. Praia do Forte sprawls wide and unbroken for more than four miles. For me, this beach strikes a nice balance: It offers amenities, without leaving feeling besieged. And Praia do Forte is clean. Even during the high season (mid-December until after Carnival in February), the city keeps the beach free of litter and glittering in the sunshine. The waves here aren’t strong enough for great surfing, but perfect for body boarding, and fresh breezes make windsurfing and kite surfing popular. You’ll also find windsurfers sharing the lagoon with fly fishermen. If you enjoy a bit of beachcombing, then I suggest starting near the tourist information center at Praça Cristovão Colombo and meandering east toward the fort. You’ll find the odd shell (also for sale if your luck is poor) and can enjoy watching others enjoy the surf. And those skimpy Brazilian swimsuits decorate the landscape. Although Cabo Frio means “cold cape,” due to the chilly currents coming from the south, this applies mainly to the deeper waters. Near shore waters are shallow and therefore generally warmer, reminiscent of Ft. Lauderdale’s beaches. Hungry? Then try a frosty açai for an energy boost. I like mine with banana or honey, but there are a 100 ways to prepare this quintessential Brazilian treat. If you fancy oysters, just wave over the beach vendor. You’ll never slurp down a fresher oyster. Locals prefer theirs only with a squeeze of lime. Fortified, continue on to the fort, which can only be reached by foot, crossing a narrow causeway. Pause for a minute and watch the local boys showing off for girls by diving from the crags into the crashing surf below. Admission to the fort, which has been restored and even includes original cannon, is free. Lean over the parapet and imagine that you are a Portuguese solider, keeping a sharp eye peeled for the tricolor on the horizon. Cabo Frio also offers wonderful dining. The fancier restaurants line the Itajuru Canal. As you might imagine, seafood figures prominently. I generally opt for the paella. You may prefer instead to join locals at a por kilo restaurant, where you can load your plate high for less than $10. Across Feliciano Sodré Bridge from Restaurant Row is the shopping district of Gamboa, where you’ll find primarily clothing—including those Brazilian bikinis, if you dare! You may notice that temperatures in Cabo are significantly cooler than in nearby Rio. They are pleasant year-round, with highs averaging from 71° F to 79° F depending on the month, and lows perhaps five or six degrees lower. Perfect. For me, Cabo is a good size. While a small, remote beach village might initially seem appealing, it can quickly turn boring. Services are also likely to be poor. In Cabo, you have entertainment options, shopping, health care, and a decent infrastructure. If you need something else, Rio is a stone’s throw away. Another appealing feature of Cabo is that so much is nearby. The chic European-flavored town of Búzios, which makes a wonderful day trip, is accessible by local bus. So is Arraial do Cabo, where you can hop a refitted fishing boat for a relaxing—but unforgettable—cruise of five hours or so. You’ll pass a floating restaurant, stop at gorgeous beaches where you can snorkel if you wish, and idle before the awe-inspiring Groto Azul (Blue Grotto). Rarely have I felt so enveloped by nature. If you fancy SCUBA diving or deep-sea fishing, talk to one of the skippers about chartering his boat. In August each year you can hop over to Rio das Ostras (Oyster River) and take in the annual jazz festival. This year Al Jarreau was one of the headliners. If you happen to also love the mountains, as I do, the Serra (highlands) lies only a couple of hours away. Be aware that Cabo does become quite crowded from mid-December until after Carnival, as cariocas and other Brazilians flock here in droves. This might be the perfect time to explore the Northeast. But for the rest of the year, Cabo Frio is for me one of the most pleasant of Brazilian beach towns, just the right size to offer what you need, while preserving an intimacy with nature. This special guide covers real estate, retirement, and more in Brazil and is yours free when you sign up for our postcards below.